A Saudi prince who negotiated a £40bn arms deal between Britain and Saudi Arabia received secret payments for over a decade, a BBC probe has found. The UK's biggest arms dealer, BAE Systems, paid hundreds of millions of pounds to the ex-Saudi ambassador to the US, Prince Bandar bin Sultan. The payments were made with the full knowledge of the Ministry of Defence. Prince Bandar "categorically" denied receiving any improper payments and BAE said it acted lawfully at all times. The MoD said information about the Al Yamamah deal was confidential. Sir Raymond Lygo, a former chief executive of BAE, told the BBC's World Business Report that there had been "nothing untoward" about the arms deal. "I was the one who won the contract," he said. "I don't know anything about him (the prince) at all. I would have remembered that name." When asked about the secret payments, Sir Lygo said that it was not going on when the deal was signed. "I would have known if it was going on at the time. I was not aware of it, so as far as I am concerned it was not occuring. "Yes, we paid agents. Nothing illegal about that. It was absolutely in accordance with the law at the time... there was nothing untoward about the deal whatsoever." The investigation found that up to £120m a year was sent by BAE Systems from the UK into two Saudi embassy accounts in Washington. The BBC's Panorama programme has established that these accounts were actually a conduit to Prince Bandar for his role in the 1985 deal to sell more than 100 warplanes to Saudi Arabia. The purpose of one of the accounts was to pay the expenses of the prince's private Airbus. David Caruso, an investigator who worked for the American bank where the accounts were held, said Prince Bandar had been taking money for his own personal use out of accounts that seemed to belong to his government. He said: "There wasn't a distinction between the accounts of the embassy, or official government accounts as we would call them, and the accounts of the royal family." Mr Caruso said he understood this had been going on for "years and years". "Hundreds of thousands and millions of dollars were involved," he added. According to Panorama's sources, the payments were written into the arms deal contract in secret annexes, described as "support services". They were authorised on a quarterly basis by the MoD. It remains unclear whether the payments were actually illegal - a point which depends in part on whether they continued after 2001, when the UK made bribery of foreign officials an offence. The payments were discovered during a Serious Fraud Office (SFO) investigation. The SFO inquiry into the Al Yamamah deal was stopped in December 2006 by attorney general Lord Goldsmith. Prime Minister Tony Blair declined to comment on the Panorama allegations. But he said that if the SFO investigation into BAE had not been dropped, it would have led to "the complete wreckage of a vital strategic relationship and the loss of thousands of British jobs". 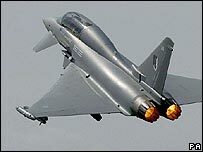 The SFO's inquiry is thought to have angered Saudi Arabia, to the point where there was a risk that BAE could lose a contract to sell the new Typhoon fighter to Riyadh. 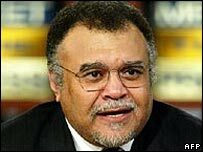 Prince Bandar, who is the son of the Saudi defence minister, served for 20 years as US ambassador and is now head of the country's national security council. Panorama reporter Jane Corbin explained that the payments were Saudi public money, channelled through BAE and the MoD, back to the Prince. The SFO had been trying to establish whether they were illegal when the investigation was stopped, she added. She believed the payments would thrust the issue back into the public domain and raise a number of questions. Labour MP Roger Berry, head of the House of Commons committee which investigates strategic export controls, told the BBC that the allegations must be properly investigated. If there was evidence of bribery or corruption in arms deals since 2001 - when the UK signed the OECD's Anti-Bribery Convention - then that would be a criminal offence, he said. He added: "It's bad for British business, apart from anything else, if allegations of bribery popping around aren't investigated." Liberal Democrat Treasury spokesman Vince Cable said that if ministers in either the present or previous governments were involved there should be a "major parliamentary inquiry". "It seems to me very clear that this issue has got to be re-opened," Mr Cable told BBC Radio 4's The World Tonight. "It is one thing for a company to have engaged in alleged corruption overseas. It is another thing if British government ministers have approved it."